The Washington, D.C., City Council passed a measure to raise the minimum wage to $15 for hourly employees on Tuesday and increased the tipped wage to $5 an hour. The Democrat-controlled council unanimously voted to hike the district’s hourly minimum wage from $10.50 to $15 an hour, a 43 percent increase. The council took up the matter as union-backed groups campaigned to put a $15 wage on the November ballot. That measure would have forced all employees, including tipped workers, to receive an hourly rate more than twice as high as the federal minimum of $7.25. Mayor Muriel Bowser brought the $15 wage to the council in March. 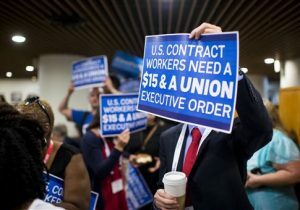 Michael Saltsman, research director of the free market Employment Policies Institute, called the measure the latest in the "fight against common sense." California struck a deal to enact a $15 minimum wage by 2022 in March after labor activists petitioned to put the proposal on the November ballot. Democratic New York Gov. Andrew Cuomo passed similar legislation in April. Saltsman said the nearly 50 percent wage hike would force businesses to cut hours, stop hiring, and raise prices on consumers to make up for higher labor costs. "Unfortunately, it's employees and small businesses who will pay the tab," Saltsman said. The bill could have gone further, as activists waged a months-long campaign to include tipped employees, such as restaurant wait staff, for the wage. Federal law mandates a $7.25 wage rate for regular workers, but employers only need to pay tipped workers $2.15 per hour. Groups, such as the Restaurant Opportunities Center, have called on state and local governments to include tipped workers in the general base-rate. The council instead voted to nearly double the tipped wage, from $2.77 an hour to $5 an hour. Workers will only receive $15 an hour in the event that their tips fall short of that minimum. Saltsman said that that a $15 wage for tipped workers would have forced restaurants to shutter or lay off staff. "It was a small consolation to see the Council recognize the considerable tip income earned by restaurant servers, and halt the radical plan to eliminate the tipped wage," he said. Some advocates were dissatisfied with the results. DC Jobs with Justice, which helped spearhead the effort, said that the exclusion of tipped workers was "not enough." "$15 minimum wage a huge step forward for #DC. $5 tipped wage progress but not enough. Onward to #JustHours #paidfamilyleave we don't stop!," the group said in a tweet. The measure will now head to a formal vote before the council later in June before going to Mayor Bowser’s desk. She has pledged to sign it into law.